Enemies: Dr. Klutch (Tough Kid Squad #1). History: The Tough Kid Squad were a group of students at Westcliff School, friends who met through the football team, who worked as a team to defeat the plans of the evil Dr.Klutch. The group included the two Danger boys, Tom and Wally, a chubby kid called Butch, the tough guy Derrick Dawes, and a Native American kid called Eagle. Comments: The Tough Kid Squad only had one appearance, so its unknown whether they would have stayed together for more adventures after Dr.Klutch was dealt with. Powers/Abilities: Wally possesses exceptional, perhaps superhuman, intelligence. Tom possesses exceptional, perhaps superhuman, strength. 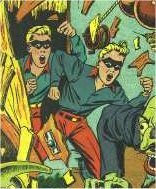 History: Wally and Tom Danger were the twin sons of Dr.Danger, a scientist who was working on a serum that would enhance human development. Each boy was given a dose of their father's serum, shortly before his villainous business partner, Dr.Klutch, murdered both of the twins' parents. The young orphans were separated, and had radically different upbringings - Wally was adopted by Professor Moxon, a scholar, whereas Tom grew up with Wong Chee, a Chinese criminal also known as The Fox. When both boys were fourteen, they finally ran into each other again - Wally had just enrolled in Westcliff School, while Tom had rebelled against his foster father and run away. After Wally sat the school's entrance exam a second time so his (identical looking) brother could get into the same alma mater, the two made friends with a number of other boys, forming a gang, the Tough Kid Squad. 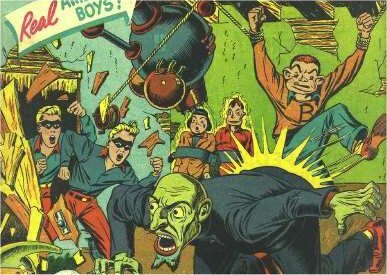 When Dr.Klutch came looking for them, seeing them as the solution to him finally cracking their father's serum, the group ensured that the Danger parents would finally be avenged. Comments: Given their heroic sounding name, their powers beyond those of normal people, and the fact that out of all the Squad, the twins were the ones who bothered with masks and costumes (of a sort), I'm guessing that if the comic had continued, the Twins might well have been intended as possibles to spin off into their own adventures. However the comic was cancelled after only one issue, any such potential was lost and they were never seen again.